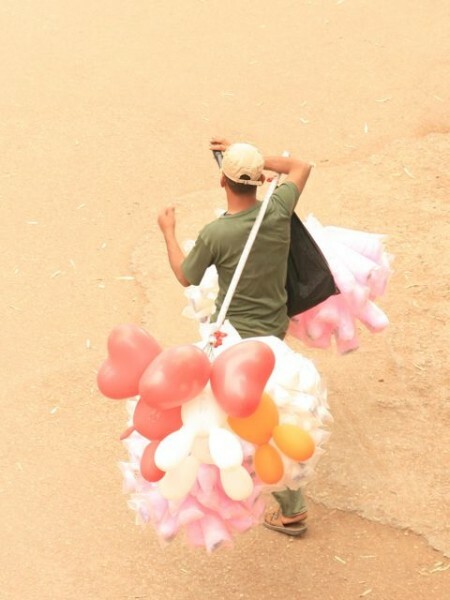 Cotton candy (and balloon) vendor. That is a kazoo-like horn at his lips, and he blows it while walking the streets, usually around the time school lets out, alerting those with a sweet tooth that he is in the vicinity. * Actually there are ice cream carts here. I need to get a pic of one; they are quite decorative, usually in the form of a swan-like bird. Don't ask me why. I love cotton candy--like eating sunset clouds.